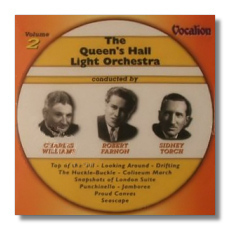 The classic second volume of the Queen's Hall Light Orchestra contains even more gems than before with a host of undisclosed delicacies that are indeed a joy to listen to. Best of all is Haydn Wood's 'Snapshots of London' suite with three beautiful movements that are genially conducted by that doyen of light music conductors, Sidney Torch. Torch is also well represented with his own music, pieces such as 'Meandering' and the delightful 'Amore Mio'. Robert Farnon, one of the finest exponents of the genre conducts the lion's share of the programme with his own works naturally represented. Charles Williams is not to be overlooked, his music is also very tuneful and highly listenable especially the legendary 'They Ride by Night'. There's a host of other intriguing and relaxing works by a string of lesser known composers such as Henman, Ellis, Yorke and Busby, you will never fail to find a tune to make you smile, and that's for certain! Dutton's documentation includes succinct biographies on each composer and the remastering almost beggars belief. For lovers of the British Light Music genre, this is not to be missed.